There's clean, and then there’s way down deep clean. The Noxzema Original Deep Cleansing Cream is specially formulated to break down and remove dirt, oil and makeup – and it conditions while it cleans, so it leaves your skin feeling soft and refreshed – all with that classic Noxzema tingle. Yes, sometimes the 'old fashioned' is the tried and true: economical, does the job and does not dry out my older skin. This stuff is the best. I use it 2x a day, morning & before bed. My skin has never looked or felt better. I started using this cleanser, along with the anti-blemish pads a few months ago as my skin changed post-baby and I was experiencing a lot of acne. This stuff is gold, and I've recommended it to a few friends who are experiencing the same issue. Within days, my skin had cleared up and the cystic acne I was experiencing hasn't returned since. This stuff is amazing and I highly recommend it, as I'll never sway from using it ever again. The only cleanser I will ever use. It's been my go-to for 35 years. Forgot how much I like this product and will now be the only product I wash my face with. Love the tingling feeling and face feels clean. I`ve used this for years, it`s still my go-to make-up remover, it`s not greasy or drying and lasts a long time. Great stuff! It got me through the worst of my teen acne years, and remains the only product that keeps my skin clear and happy. I use it every day under some sunscreen! A family member likes to try expensive brands for her skincare so it took some convincing to get her to try something so simple and affordable, but she's a believer now! I had forgotten how great this product is. I haven't used it in years, thought I'd try it again, and it is now a staple. Not sure why I ever stopped using this stuff when I was younger. Now that it's back in my life, my face has never had fewer blemishes. Can't mess with the classics. Haven't used this in years. I had forgotten what a wonderful product it is. Very refreshing. The only face cream I will use! LOVE this product. It really deep cleans and leaves you FEELING deep cleansed but never dry. Love the original scent. LOVE! Cleans like no other and I love the fresh tingle afterwards! My husband sneaks into my bathroom to use this product now! LOVE this product as a facial cleanser, removes makeup, is moisturizing and feels soothing on sunburned skin too! Great product, cleans pores and refreshes skin, it is also great to cool sunburned skin. Love the tingle, it's great for dry skin. 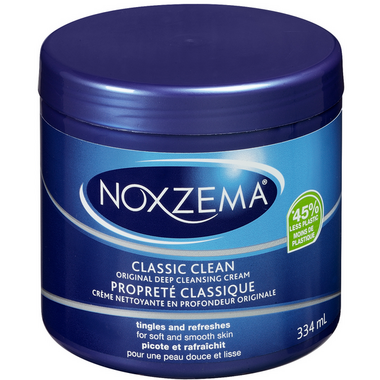 I used this for years, stopped for no good reason and at a family gathering my cousin and I were chatting over things and she mentioned Noxzema. As soon as I got home I logged on to Well.ca and ordered it with some other goodies and it is back in my favourites to stay! By the way this is a large jar so don't let the price sway you! It is great! This is another product that I haven't used in years. I bought it again on a whim, and now I wonder why I ever stopped using it! It's the best for dry skin. My son used it during his teenage years and it kept his face free of pimples. I think I'm back to stay!
" Cool " and refreshing.Very soothing for the skin. You'll wounder how you got along without it. It's just a feel-good thing to do before going to bed.